Big & fluffy! Just what I wanted. Great price too! Lofty, luxurious, and lush, this comforter is a magnificent way to keep cozy on cold nights. The soft cotton shell boasts a thread count of 500 and a serene white color for blending with any decor schemes. Baffle box construction keeps the polyester fill neatly distributed and in place, while the oversized design provides excellent coverage for your whole bed. I searched for at least a month to find a down alternative comforter that would be fluffy with thread count of at least 500. I was excited when I found this. I wanted an alternative to down because I didn't want to deal with the feather pricking my skin and the feathers possibly coming out. This product is just that. The filling is pretty consistent throughout. It didn't take many hours once I took the comforter out of the package for it to fluff up. It is very warm. I like to turn my air on and snuggle under the comforter. I definitely recommend this to anyone who is looking. I purchased because it was from the Hotel Grand Collection. I am thoroughly impressed and satisfied. This is my first down alternative product I've ever purchased, and you can bet I will purchase it again. Wonderful comforter, soft fabric, and LOTS of fill. It's just the perfect weight (I don't like heaviness on my feet), and keep me very warm and cozy. There was no "new" smell on it at all. I ordered the king size for my queen sized mattress, and I am glad I did - fits great. I only gave it 4 stars because like one of the other reviews, it was shorter length wise, and wider width wise. I have to really pull it up to cover my neck and chest at night. That's my only woe though. I absolutely LOVE this comforter and would definitely recommend this to anyone that wants to stay comfy all night! Sqwunchie!!! Luxurious Alternative Down Comforter for College! My daugher is heading to college in the fall and, as an attentive mother, my first thought is that a good night's sleep is most important. She has always loved using an alternative down comforter at home, loving the weight of the comforter (not too heavy but excellent warmth). She wanted one similar to that on her bed at home. Obviously, shopping for college can get expensive and I wanted to provide her with the comforts of home. This comforter is more than that....it's luxurious and the fabric is very high quality. I know after a long day at school when she curls up into bed, this will provide her with a great nights sleep! I would HIGHLY recommend this to anyone, especially those who have allergies. Down alternative is so much better for anyone who is highly sensitive to allergens.. Would not go back to feather/down comforters. Love this comforter! I always worry about them not being as big and fluffy as they look in the site photos but this one is great. I've had down comforters for years and have grown picky. This one is plenty big, not too heavy so you fell weighted down, but lots of cuddly warmth. Ours covers the king bed adequately. I like some overhang but not so long that it feels like a weight dragging downward. It's just right. Wow!!! Glad I bought this comforter. It has nice fill to it not flat at all beautiful white color with soft white stripes. Stitching keeps fill in place. Just put it on my bed and I totally love it. Great price too! The oversized comforter is perfect for my king bed. I have a 3inch foam topper on the bed and still the comforter fits great. My only concern is how the filling is distributed. I guess time will tell. The 500 thread count fabric is so soft. The down alternative is so lofty and warm. The oversized comforter is very ample on our king sized bed. Love it! I bought this comforter as opposed to down because of allergies. I have never owned anything down alternative and was hesitant, but I am SO PLEASED! The fabric is very soft, durable, and a good thread count. High thread count was a must. It is very fluffy, and has held it's fluff so far. I have had it for almost a month. The other thing that is awesome is the size! It is oversized!! I have a king bed, and every king down comforter I have ever purchased barely hangs off the side of the mattress, which in turn leads to fighting for covers between my husband and I at night! This comforter hangs down past the box spring, and that's even with a huge fiberbed on top of my mattress. Over all, GREAT product for a GREAT price! I am considering ordering another in the near future just to put back. The fabric and workmanship on this comforter are top quality...the kind you would find in a luxury hotel. We put it on our bed and felt as though we were sleeping under a cozy cloud! Lots of overhang of both sides of our king-sized bed. After a few days I noticed that the fill had shifted somewhat to the bottom of the baffled rectangles. I wondered if it would be as warm with these spaces of fabric with no fill. When I have time, I will even out the fill and hand-sew an 'X' across each square to keep the fill evenly distributed. Aside from this, it is a definite five star comforter, the nicest workmanship I have ever seen! I read the reviews before I purchased this quilt, so I knew there was a small issue with size; but when I got it, I was extremely disappointed at the size discrepancy -- much worse than described in reviews. I ordered a king sized quilt, and when I attempted to fit it into the king sized duvet cover I had, there was almost a foot of extra material dangling over the bed. To make matters worse, the quilt had sewn pockets with "puffs" inside of them which protruded out from the duvet cover, making the bed look "lumpy" -- this is a big red flag to those trying to get the correct sized quilt, and one with a smooth surface. Very plush and well made. Feels just like down. I love it! It is the same quality that you would find in a 5 star hotel. This is a great alternative for allergy and asthma conditions. I really, really love this comforter. It's warm though, fair warning. I'm only able to use it in the winter due to that. It's a tight fit in my washing machine, and it came out a little lumpy from the dryer - but I didn't tumble it with tennis balls either. I'll know for next time! Still, a great comforter. I love it! I have had this comforter for about 3 weeks, and it's great! I did purchase a king size for my queen sized bed based on other reviews, and I agree that that's the best choice. It's the perfect size to cover both my husband and I. It has a nice weight that keeps you warm even on the coldest nights. I love this comforter. It is the perfect weight to be cozy but not too heavy. I have washed it twice now and it still looks great. My two small dogs sleep in the bed with us and this comforter stands the test of all their romp and play. I just wish it were a little longer from head to toe. The sides drape over the edge of the bed nicely. I ordered this comforter as an early Christmas present for my husband and myself - and it's going to be a Merry Christmas indeed! 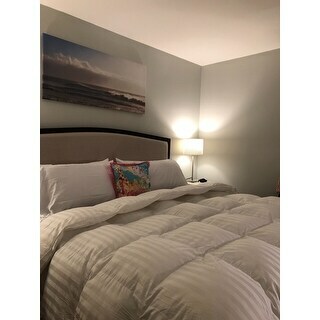 The comforter is incredibly silky on the outside, the stuffing inside has great loft, it's warm but not too warm, and it has a great weight to it! We are thrilled with this product. It did arrive in a plain comforter bag with no brand markings anywhere which concerned me until I opened it - the product really speaks for itself, no brand name really required. I would highly recommend this comforter! If was much lighter weight than I wanted and the filling clumps up too much. I absolutely love this blanket. When I took it out of the package it was pretty flat but after a couple of days it fluffed up. I had previously bought a down comforter from another retailer and returned it as it was not warm or fluffy. I would highly recommend this blanket. LOVE the QUALITY and FEEL of this comforter ! Perfect size / fit - I ordered a king so it hung well over the sides of my oversized queen guest bed. I would DEFINITELY recommend this & buy it again ! Didn't love it. Quality was so so but good enough. Amazing size and incredibly soft. Fantastic product! Perfect for all seasons! Fits a duvet perfectly! Great quality! I am very pleased with this purchase and would recommend this product! Does not bunch up when washed, and I wash it often. I would buy again. Nice weight and stays fluffy without bunching up in any one place. We get compliments on it for being a good comforter for winter months in Maryland. "Can you use this as a duvet insert?" You sure can! I purchased this to be used as a duvet cover. It is medium to heavy weight and VERY fluffy which is what I wanted. I will be buying another for my queen bed very soon. That is what I purchased it for. Works well, excellent quality. "Trying to get away from duvet covers and top sheets. Looking for a good cotton comforters . Could this be used alone. Getting old stinks." Yes, this can be used alone with no covers. Yes,this is machine washable and dryer safe. It says yes but I haven't had mine long enough to clean it. I can tell you though that it's heavenly! I ALWAYS buy down and this time I decided to try the down alternative. I really love it. "Where can I get the same pillow covers?" "Is this white or ivory"
This is white. I hope it helps. "How does this hold up after being washed? Does the inner fill lump up or shift?" My experience after washing is that the filling lumps up leaving some sections empty. Overall I think it's a nice, warm comforter. "this says oversized king, however the measurements are for regular king. is there an oversized king and if so what are the measurements and where do I find it on this site?" The size of the King of this comforter is 108”x 90”, which is oversized, the regular King size is 102”x 86”. Can you use this without a duvet cover?